A story of romance, adventure, and suffering. Thanks to this game I can now add “Literature Club” and “cupcakes” to my list of trigger words. Doki Doki Literature Club changes a man. This is one of those games that’s the most frustrating to review, because to talk about what makes this game special would give it all away. There’s only one thing you need to know before going in yourself: keep going no matter what, because this game is not what it seems. What does it seem like at first? A bland, trope-heavy harem-style visual novel, albeit with good art and above-average writing. 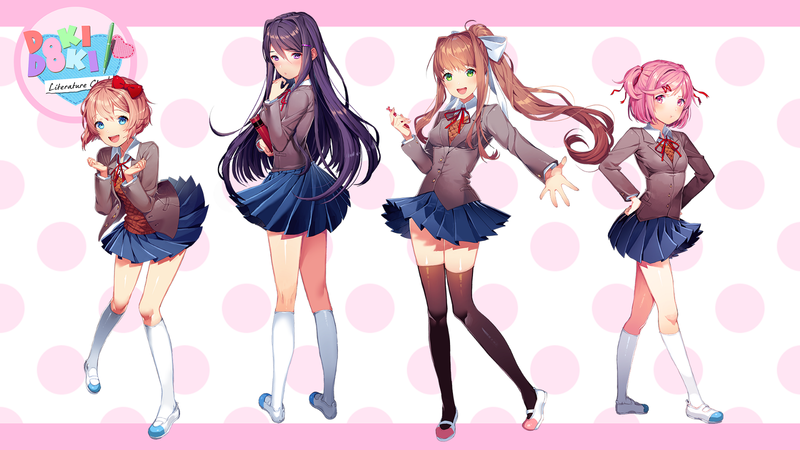 You have your small band of love-starved schoolgirls, each with their own eye-rolling stereotype: you have your air-headed pixie dream girl Sayori, your shy bookish weirdo Yuri, your Grade-A captain-of-everything Monika, and your jerkass tsundere loli Natsuki. Petty fights ensue. Choices are made. Hearts are broken. Love is confessed. Yada yada yada. or those who are easily disturbed. And that’s all I’m going to say about the plot. Period. Any more than that would ruin it. What I will say is this: heed that warning. It makes it tough to decide who I would recommend this game to (and I do, do recommend it); visual novel fans who just want a little cute harmless drama will get more than they signed up for, and non-visual novel fans will have to suffer through an entire visual novel until things start to get…different. The only reason I heard of it was through word of internet and the reports of the hidden horrors within. I went into it blind, as anyone reading this should. And by the time the credits rolled I think I broke at least 3 things on the spiritual level. I might have concerned my roommates a little as I staggered downstairs and gibbered about the evils of Doki Doki Literature Club. In the same wide-eyed breath I recommended that they give it a try themselves. Again I won’t spoil story, but I’ll tell you about what I felt. First came boredom. Then happiness. Then sadness. Then fear. Then sadness again. Then fear. Then fear. Then fear. I write about cartoons, video games, and all sorts of nerd things.